Every brew should start with a fresh grind, because entropy begins to set in almost immediately. An airtight container can help, but only for so long. And the fridge? Don’t get me started. NEVER PUT COFFEE IN THE FRIDGE OR FREEZER! In all the vast and diverse world of coffee, one thing that every truly great cup has in common is that it was beans about five minutes before. 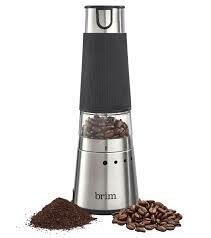 There’s only one way to grind coffee beans, and that’s with a burr grinder. Actually, there are two ways, the other being a blade grinder, but I don’t recommend it. Blade grinders work more like a blender, with whirring blades at the bottom of a container. Because of this, the consistency of the grind (meaning the size of the individual grinds) turns out to be very, well, inconsistent. Worse, the blades actually heat up and “cook” the beans slightly, altering their flavor. Burr grinders consist of two cutting discs, called—wait for it—burrs. The consistency of the grind is determined by the distance between the burrs. The closer the burrs, the finer the grind. There are two types of burr grinders: manual and automatic. Both work just fine, but I prefer the manual for aesthetic reasons. There’s also just something satisfying about grinding the beans with my own hands, like the Pilgrims did, probably. The rhythmic motion induces a sort of meditation, a Zen state of oneness with the coffee. Or something. 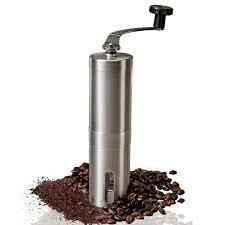 Even better, manual grinders are more compact and good for travel. They’re also much more affordable, while automatics can cost upwards of $50. So, to grind your coffee, start by figuring out how much you need for only that sitting. Using a kitchen scale, measure out the beans. A good rule of thumb is to use 1 tablespoon per cup, or 15 grams of coffee for every 250 grams of water, to be precise. For a shortcut, just go by the amount of coffee your grinder can hold. In my case, a 24-oz manual grinder holds just enough for my 20-oz tumbler. 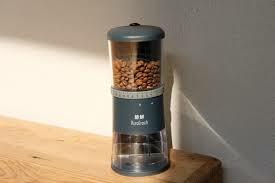 As for which grind to use, it depends on the recipe and the brewing system. Different beans and different filters will produce different results with finer or more coarse grinds. For example, the Aeropress system’s tight filters allow for a very fine grind, intensifying the flavor. Feel free to experiment. Once you’ve set the grinder to the desired consistency, simply turn the crank until you can hear that all the beans have been reduced to delicious brown powder. Brew to your liking, and drink away. The extra minute or two it takes to grind your own beans is worth its weight in goodness, as your taste buds will attest. No matter where your coffee journey takes you, no matter what varieties or brewing systems you try, never, ever forget this first rule.